If you are planning to administer any of these tests, feel free to download the answer keys (and any others you might find in our database that you would like to use) and then upload them to your PREP.BubbleScan account. Please note that these are for NEW ACT or ACT 2015. If you are still using the old ACT format, please consider switching. All new development is based on the new ACT format, which really only differs from the old in the way Essay scores are reported. Please contact us if you have any questions. 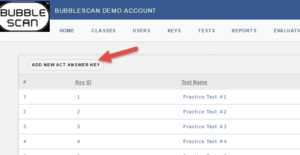 Click on the test name to download the csv file. 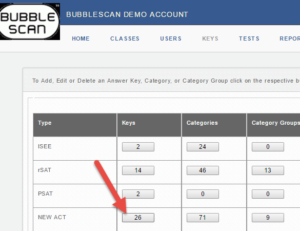 Select to ADD NEW ACT ANSWER KEY and select the answer key file you want to upload.